Joel Osteen reaches one of the largest audiences in the U.S. and across the globe--more than 42,000 people attend his church every week, and millions more tune in by television to hear his words of inspiration and wisdom. 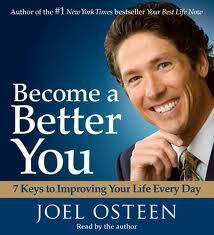 His first book, Your Best Life Now, has sold over 4 million copies and is available worldwide in 17 languages. His message of hope is helping people find a closer connection with God by learning to apply the principles of Scripture to their everyday lives. In this new book, Become a Better You, Joel Osteen offers seven simple yet profound action steps that will help readers discover the better things they were born for... their individual purpose and destiny. As charming and passionate on the page as he is in person, Osteen incorporates key biblical principles, devotions, and personal testimonies that will uplift and enlighten readers. He speaks directly to the hearts and concerns of people from every walk of life. People love Joel Osteen--they love to be in his presence, to hear him speak, and to read what he's written--they just can't get enough of him. Each step is broken into several chapters and each part ends with a series of Action Points intended to give the reader concrete steps to tak to improve his life. It is, frankly, a lot like every other self-help book on the market today, but with one crucial difference—this one is built, supposedly, upon the Bible. A: Of course, my greatest hero is Jesus Christ. He should be everyone's greatest hero. However, among men, I have two real heroes. My father, John Osteen, was not only the best father anyone could ever have, but was my best friend as well. He was a man of great integrity, and he taught me how important it was to incorporate Jesus Christ into every part of my life. Another of my heroes is Billy Graham who throughout the years has remained true to that which God called him to do and has done so with the utmost dedication, humility, and integrity. Q: In today's conflicted world, how do you encourage people to maintain their faith? A: As believers we should be assured that Jesus said He would never leave us nor forsake us. We should adopt a mindset that God wants to be involved in our everyday lives, through good times and difficult times. We should communicate with God throughout our day (to pray without ceasing), not just when we are in crisis. He cares about our lives even in the small things. There is no part of our lives that are insignificant to Him. Q: What did working behind the scenes at Lakewood during your father's ministry inform how you preach today? A: Really it all started for me when I was born. Our family never missed church; Sunday morning, Sunday night and Wednesday night, week in and week out. However, for 17 years I did produce and edit my father’s sermons for television. I often joke that I attended one year of college and 17 years of seminary. For those 17 years, I would have to study my father's weekly sermons and then cut them down to a 28-minute TV program while maintaining the message. I guess I've listened to at least 1,500 of my father’s messages. Q: Your ministry reaches millions each week through television and the Internet. How has technology changed how people worship today? A: Through telecommunications technology, especially the web, more Christian programming is available than ever before. Not only do people have more choices in Christian programming, but they can get as much as they want whenever they want it. I think that our use of technology results in people spending more of their time thinking about the things of God. However, I don't see technology replacing worship in the traditional sense--that is worshipping with other believers in a church. Everyone should belong to a good Bible-based church. Q: In our busy lives, what is your advice for how we can slow things down and find peaceful moments? A: Personally, I take time each morning to spend with God. I have a quiet place in my home or I find a quiet place if I am traveling where I pray and seek guidance from God. I think that is the best way for anyone to start their day; it really sets the tone for each day. Q: As a father, what advice would you share with parents struggling with our fast-paced culture? A: Victoria and I decided a long time ago that our family takes priority over most everything else. I tell people all the time that their families should be their first mission field. Today, it takes a great deal of our time and energy to make a living. We need to make sure our families don't get the short end of the stick and we need to make time for them. And, I am talking about "quality time"; no cell phones, no business calls, no outside distractions, just family.